As the project manager, you need to monitor and control your project throughout its life cycle. You start with the initial plan and continue to tweak the project until completion. 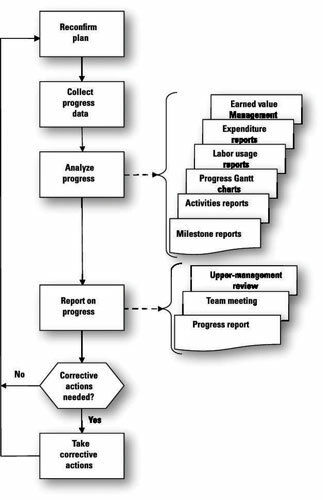 This flowchart shows the routine activities and the information produced when you are controlling project performance. At the start of each performance period, reconfirm that the necessary people and resources are available and scheduled in accordance with your current project plan. Gather activity start and end dates, milestone dates, resource expenditures, and the results of quality assessments. Compare the actual results with the planned results, identify any issues or problems, and take any necessary corrective actions. Report your progress for the period to your project audiences.